The most populous city in the state of Georgia and also the state's capital, Atlanta is located in Fulton County in the northern half of the Peach State. A cultural and economic hub for the state of Georgia, Atlanta is the 38th most populous city in the United States and covers an area of approximately 134 square miles. The city has a population of around 490,000 people, with around 5.8 million in its surrounding metropolitan area, which is the ninth biggest in the nation. Atlanta was founded in 1837 due to its ideal location at the crossing point between two railroad lines. The city was a prime transportation location, serving many parts of the United States. Unfortunately, the American Civil War hit Atlanta hard. Many battles, including the famous Battle of Atlanta, occurred in the area and resulted in the destruction of much of the city. However, when the Civil War ended, Atlanta's fighting spirit shone through and the city was gradually rebuilt even bigger and better than before. The city of Atlanta played a big part in the Civil Rights Movement of the 1960s and became a hub for many major businesses, as well as becoming a popular tourist spot. In addition, just like in the past when Atlanta was a major transportation city, it now houses the world's busiest airport in terms of passenger traffic in the form of Hartsfield-Jackson Atlanta International Airport. Well-known for a diverse economy, unique landmarks, and many green spaces, the city is a beautiful place to visit. When considering the geographical statistics and location of any town or city, both in the United States and internationally, elevation is a very important term. Elevation tells us how high or low an area is in relation to sea level. The elevation of Atlanta is 1,050 feet (320 m), which means it has one of the highest elevations of any major city in Georgia and is actually one of the highest cities located to the east of the Mississippi. Various high points can be found in and around Atlanta. The highest point in the Atlanta metropolitan area is Kennesaw Mountain, which stands at an elevation of 1,808 feet (551 m). Atlanta is a relatively high city. Many other major cities all around the United States are situated at elevations of 500 feet (152 m) or less, with New York City and Los Angeles being two key examples. The highest city in all of Georgia is Sky Valley, which is located in a mountain valley in Rabun County and has an elevation of 3,100 feet (945 m). The highest point in the whole state is Brasstown Bald, a mountain in the northeast section of the state standing at an elevation of 4,784 feet (1,458 m), while Georgia's lowest point is technically the waters of the Atlantic Ocean, which are simply at sea level. The mean elevation in the state of Georgia is 600 feet (180 m), which is also the same mean elevation as the states of Illinois and Maine, making Georgia one of the lowest states in America in general. When compared to the state average, the city of Atlanta has a relatively high elevation. Other major cities in Georgia apart from Atlanta include Augusta, which has an elevation of just 136 feet (45 m), Columbus, which has an elevation of 243 feet (74 m) and Macon, which has an elevation of 381 feet (116 m). Atlanta has a much higher elevation than these other major Georgia cities. The city of Atlanta has a humid subtropical climate, with four unique seasons and a lot of rainfall. Summers in Atlanta tend to be very hot and wet, while the winters are quite cool, with temperatures often dropping below freezing point. July is the hottest month of the year, with temperatures averaging around 80°F (27°C), while January is the coldest month, with averages of 44°F (7°C). Some snow can rarely fall in the winter months, but the main form of precipitation in Atlanta is rain, with around 50 inches falling per year. As the capital city of Georgia, Atlanta is a key touristic location for the city and offers a lot of attractions and activities for visitors to see and experience. The city is known for its impressive skyline, along with its green areas, including lakes and forests. 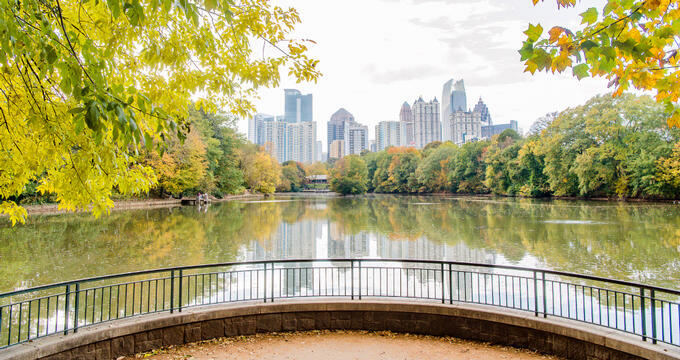 Atlanta even has the nickname "The City in a Forest", so is a great sport for outdoor recreation. Key landmarks around the city include the CNN Center, the Martin Luther King Jr. National Historical Park, the Capitol building, and Swan House.